What have a Pole, a Gabonese, a Mexican and a German have in common? They lead the race to win the Bundesliga golden boot. Bayern Munich appear almost unstoppable at the top of the Bundesliga, with closest rivals Borussia Dortmund well clear of third place Hertha Berlin, who they face this weekend at the Olympic Stadium in Berlin. Bayern have a tricky fixture as they travel to North Rhine-Westphalia, to face Bayer Leverkusen in the BayArena. These fixtures bring together the league’s top four goal scorers, with Dortmund’s Pierre-Emerick Aubameyang on 20 league goals, one ahead of Bayern’s Robert Lewandowski, who in turn has scored five goals more than his Bayern teammate Thomas Müller. Leverkusen’s Javier Hernández is on 13 league goals, having contributed the highest percentage (45%) of his team’s league goals. The styles of these marksmen are very different, with Lewandowski and Aubameyang playing the more traditional striker’s role. Lewandowski attempts a high number of dribbles (8.1 per game) and whilst Aubameyang attempts fewer dribbles (4.8), a higher percentage of his dribbles (52.6%) were rated as being good. Despite this, Lewandowski’s dribbles result in the creation of 0.5 chances per game, compared to only 0.1 chances a game from Aubameyang’s dribbles. Lewandowski averaged slightly more chances per game (6.4) than Aubameyang (5.5) and a slightly higher percentage of on-target shots (55.4%), but the Dortmund striker was the more clinical, with a higher percentage of dangerous shots (33.8%) and a considerably higher percentage of goals per shot (26.1%) than Lewandowski (16.9%). 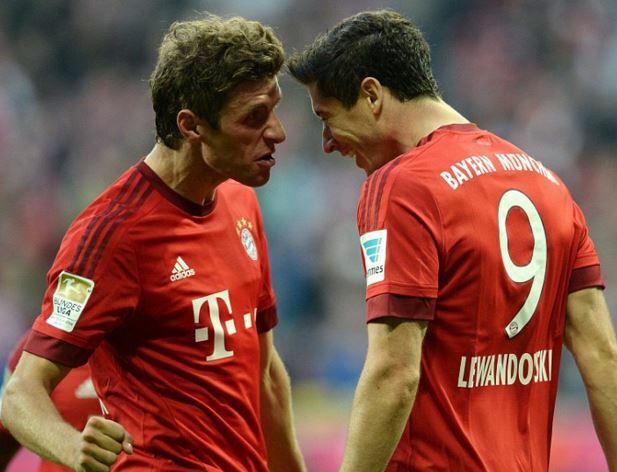 Müller is more flexible than the other strikers, mostly playing behind Lewandowski and relying much more on his pace, intelligence and technical skills. A lower percentage of his chances ended with a shot (55.6%) and of the four players, he had the lowest percentage of on-target shots (42.6%) and by far the lowest percentage of dangerous shots (16.7%). He was more clinical than Lewandowski, converting 24% of his shots into goals. Müller ranked first in reaching long ball passes and performed the highest percentage of good actions (45%) when receiving long ball passes. Hernández, with his good movement and pace, is the archetypal lethal fox in the box striker. Although he reached fewer chances per game (3.6) than the other three strikers, he struck the highest percentage of dangerous shots (34.2) and the highest percentage of goals per shot (29.8%). If the race to win the Bundesliga title already seems like a foregone conclusion, the race to win the Kicker Torjägerkanone – the league’s top goal scorer, is one that is likely to run for considerably longer.